To assess growth promotion and cytotoxicity characteristics, Corning Classical Media products undergo a variety of tests to determine functionality and toxicity using growth-promotion analysis. Product performance is measured by harvest-to-plant ratios or fold increase according to predetermined specifications. Liquid and powder classical media products are also tested to determine pH and osmolality. Classical media powders are also tested for residual moisture. The pH and osmolality tests are performed according to specific procedures in which all equipment is calibrated using standards traceable to the National Institute of Standards and Technology. Biological testing of Corning liquid classical media products guarantees low levels of endotoxin, mycoplasma, and an absence of contamination. 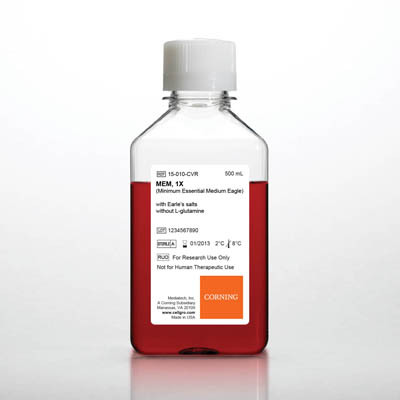 Endotoxins: classical media products are tested for bacterial endotoxin using the Limulus Amoebocyte Lysate (LAL) Chromogenic Assay. For release, each lot of standard liquid classical media must have an endotoxin level of less than 0.25 EU/mL. Classical media powder products must have an endotoxin level of less than 0.25 EU/mL when reconstituted to formula weight with low endotoxin water. All Corning liquid classical media products are tested for sterility and liquid classical media products are tested for mycoplasma off-site using a large-volume method. Formulazione Inorganic Salts: 200.00mg/L CaCl2 (anhydrous), 400.00mg/L KCl, 97.70mg/L MgSO4 (anhydrous), 6,800.00mg/L NaCl, 140.00mg/L NaH2PO4.H2O, 2,200.00mg/L NaHCO3; Amino Acids: 126.40mg/L L-Arginine. HCl, 31.20mg/L L-Cystine.2HCl, 41.90mg/L L-Histidine.HCl.H2O, 52.50mg/L L-Isoleucine, 52.50mg/L L-Leucine, 72.50mg/L L-Lysine. HCl, 15.00mg/L L-Methionine, 32.50mg/L L-Phenylalanine, 47.60mg/L L-Threonine, 10.00mg/L L-Tryptophan, 51.90mg/L L-Tyrosine.2Na.2H2O, 46.80mg/L L-Valine; Vitamins: 1.00mg/L D-Calcium pantothenate, 1.00mg/L Choline chloride, 1.00mg/L Folic acid, 2.00mg/L i-Inositol, 1.00mg/L Nicotinamide, 1.00mg/L Pyridoxine. HCl, 0.10mg/L Riboflavin, 1.00mg/L Thiamine. HCl; Other: 1,000.00mg/L D-Glucose, 10.00mg/L Phenol red. Na.